It feels a very long time ago when in 2003 I was assigned to solve a problem in variable data printing — when colored text is printed on a colored background and the colors are variable, the text may become unreadable. Since each copy is different in a variable data job, manual proofing is not feasible and an algorithm is required. Conventional colorimetry is of no use, because it deals with color matching — small color differences — not the large color differences to be considered in readability issues. Required to quickly deliver some code, I came up with a heuristic based on ∆E units. Silvia Zuffi and Carla Brambilla of the CNR in Milano-Bicocca have revisited that work and performed genuine research replacing my heuristics. Once the code was delivered, I implemented a different algorithm more suited to the task. As the research by Zuffi and Brambilla shows, the readability problem can be formulated as a reading speed problem. From Stevan Harnad's work we know that color discrimination is faster for colors in different perceptual color categories than for colors in the same perceptual categories, when their perceptual distance (∆E) is fixed. 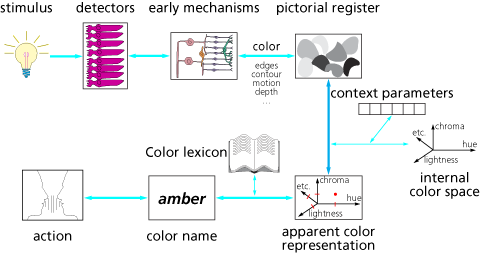 The most obvious way to introduce structure in a color space, i.e., to introduce perceptual color categories, is by considering color names. The new problem now is to find a 3-dimensional tiling of a color space. I had the data for Nemcsics's names in the Coloroid system, so I implemented that. The implementation of the readability solution was then straightforward. 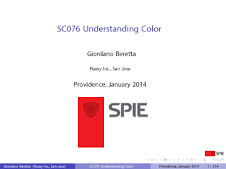 I used the lexical distance between the two colors and required at least 2, i.e., there had to be at least a color name between the two color's names. The solution performed only so-so. In fact, there were a number of issues. The tiling does not cover the whole gamut, so it needs to be "stretched"
There is no reference in the literature on the origin of the categories and names — did Nemcsics cook them up heuristically? 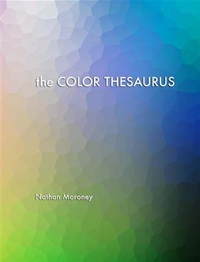 co-blogger Nathan Moroney always interjects that color categorization may occur much earlier. 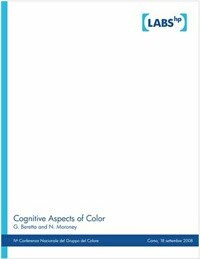 The paper Categorical perception of color is lateralized to the right hemisphere in infants, but to the left hemisphere in adults in a recent issue of the Proceedings of the National Academy of Sciences comes very close to answer this question. Franklin et al. take advantage of the difference between the left and the right hemisphere of our brains (let us assume for a moment we are all right-handed and have a normal corpus callosum) that the left hemisphere is geared to encoding categorical or relational information, while the right hemisphere is geared towards encoding metric information. 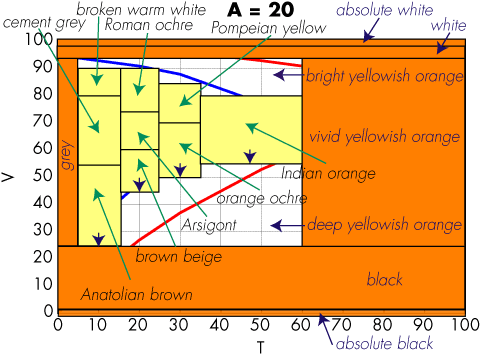 The linguistic hypothesis in color categorization is that colors are tagged by their category name and the tags are compared, i.e., that language mediates categorical color perception. 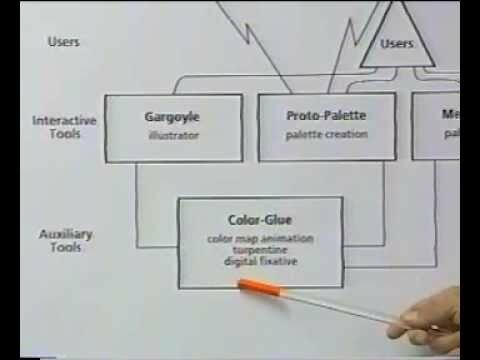 The question is whether the color categorization is prelinguistic, i.e., whether there is a universally available color categorization and language just makes some minor adjustments, or color categorization is built from scratch after language is available. (remember the neural axons get crossed in the optical chiasm). Categorical color perception is found in infants; however, the absence of a category effect in the left hemisphere for infants, but the presence of a greater left hemisphere than right hemisphere category effect for adults, suggests that language-driven categorical perception in adults may not build on prelinguistic categorical perception, but that language instead imposes its categories on a left hemisphere that is not categorically prepartitioned. Their findings therefore suggests that there is a form of categorical perception that is nonlinguistic and right hemisphere based (found in infancy) and a form of categorical perception that is lexically influenced and biased to the left hemisphere (found in adulthood). Categorical color perception is found for both infants and adults, but the contribution of the left hemisphere and right hemisphere to categorical color perception appears to change across our life span. Our digital presses are for adults, so my approach is valid.